Hey guys!!! I hope you all are well! Today's post is one that's been in the works for a while. 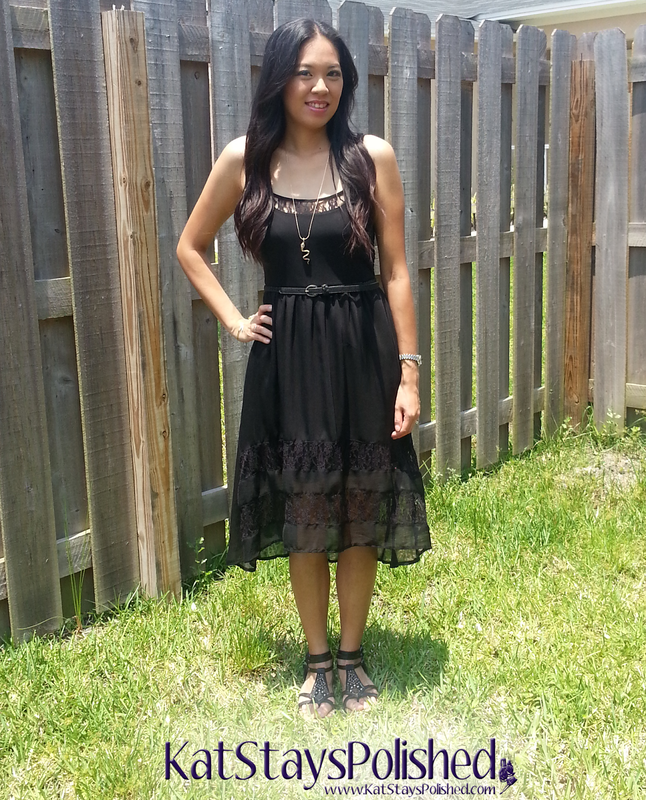 I got to work with Kohl's to bring you an entire look for under $100. I have been a Kohl's card member for a very long time. It's probably one of my favorite stores to shop at because I can get everything I need from clothes to shoes and even stuff for my house at incredible prices. You can always find great deals and stack coupons on top of those already fantastic deals. This post is dedicated to a summer concert/summer in general look. Everything in this post came out to $99.08 [not including tax]. Almost everything I bought was on sale or clearance and I had a 20% off coupon to apply to my order. If you'd love to know how I did it and to see the final look, please keep reading. Okay, so I had a little help from my friends Nicole and Daisy. I decided to do all my shopping online at Kohls.com because sometimes there's a different variety of items and online exclusives that you can't find in stores. As I was trying to come up with a look for my "Under $100 Look" I wanted to start with the item I knew would cost the most - my makeup palette. Did you know that Kohl's has been selling prestige brands of makeup for a while? You can find brands like The Balm at your local Kohl's and Kohl's online. Keep in mind that discounts and coupons may not apply to these brands of makeup. That's why I added it to my online cart first. I had been eyeing this palette for a while and decided that it would be worth the investment. Now that I have my makeup palette choice, I can build the rest of my outfit. 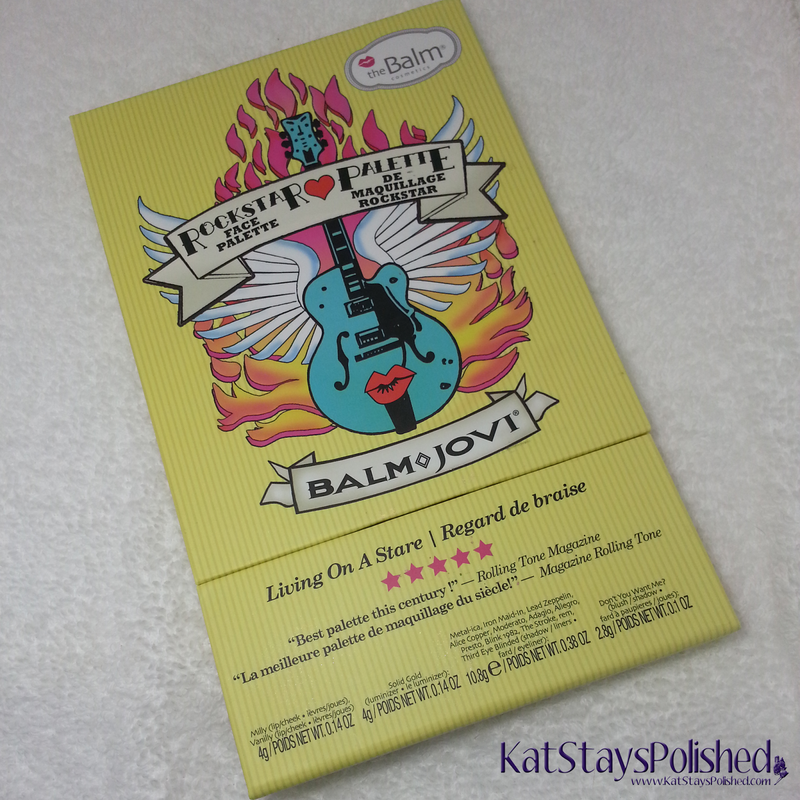 Since the Balm Jovi palette is Rock and Roll themed my friends and I decided that the outfit should follow that theme too. Why not get dressed for that big summer concert you've been waiting for? This palette was $39.50. Okay, so here is the dress [photo source: Kohls.com] that we decided on. I've always wanted a hi-low dress but just never got around to buying one. It's not cotton and the material is nice and thin so when you're out at those concerts, you're going to be comfortable and stylish. This dress is modest and appropriate for girls of all ages. The final price of this dress was $15.19. Now that we have the makeup and the dress, let's move on to the accessories. The snake was completely Nicole's idea. It definitely says "rock and roll" and the spike jewelry was thrown in the mix of options for me to choose from. One thing I love about shopping for accessories online is that there are usually a lot of clearance items and sometimes you get lucky with awesome pieces like these. 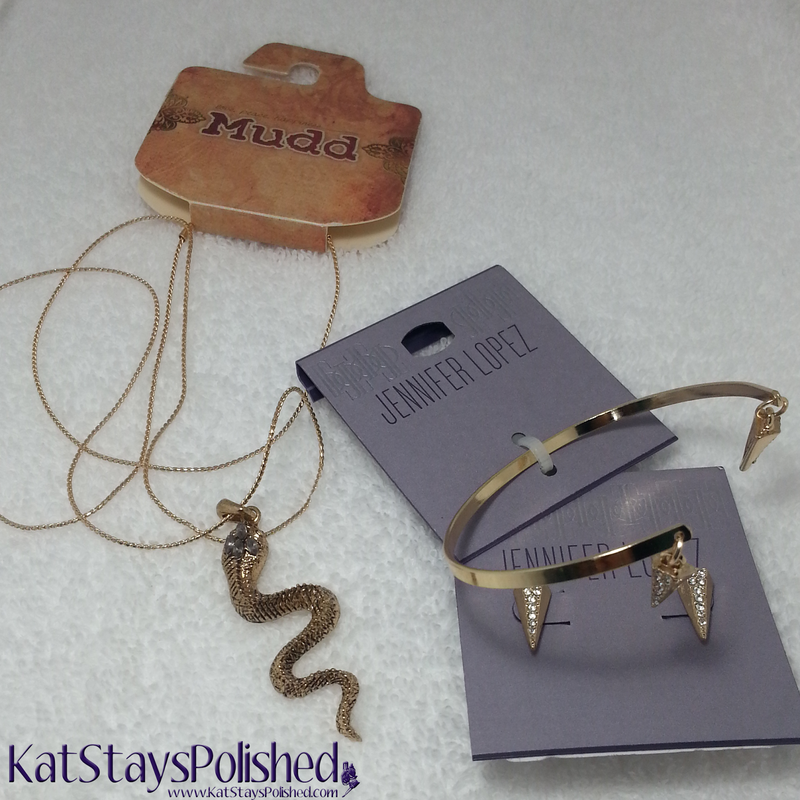 The snake necklace from Mudd was $3.84. 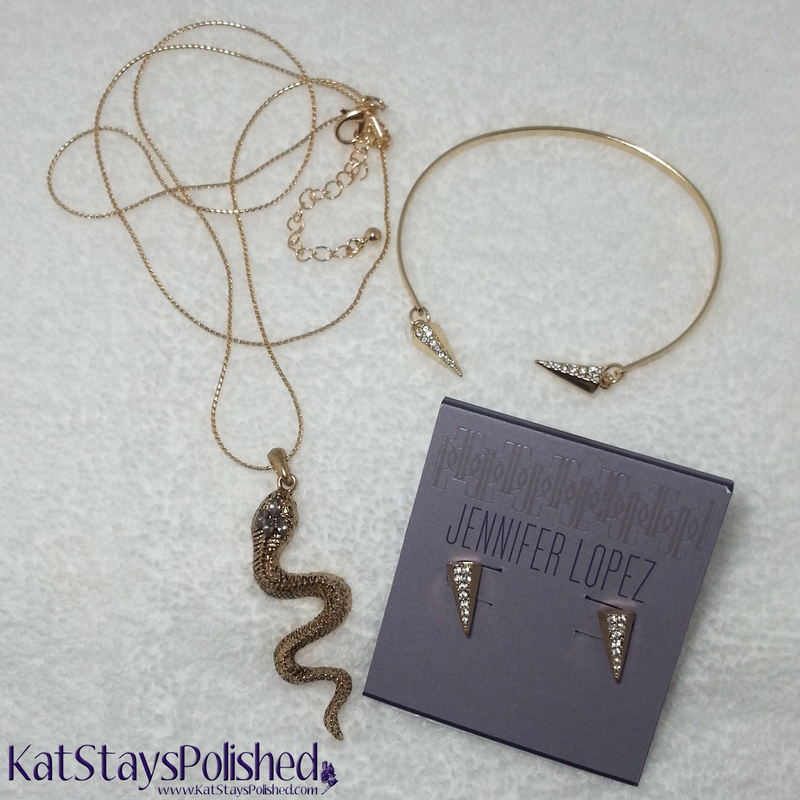 The Jennifer Lopez earrings were $3.84 and the matching bangle was $4.32. We're coming close to the $100 mark and we still have a few more things to buy! You can't complete any outfit without the perfect pair of shoes. Check out these Mudd Gladiator Sandals. They have cute embellishments on them to make it a little bit more feminine. This is my first pair of gladiator sandals. They are very comfortable and if you're going to be walking around a lot that that summer concert of yours, you definitely want to make sure you won't be hurting those feet. There are 3 straps on this sandal but it also has a zipper at the heel which makes it easy on, easy off! These shoes cost $23.99. This last item was a last minute idea. How can you go anywhere without something to carry your personal essentials? I found this mini crossbody bag on the Kohl's website for just $10.50. Add the 20% off discount to that and my final cost for the bag was $8.40. 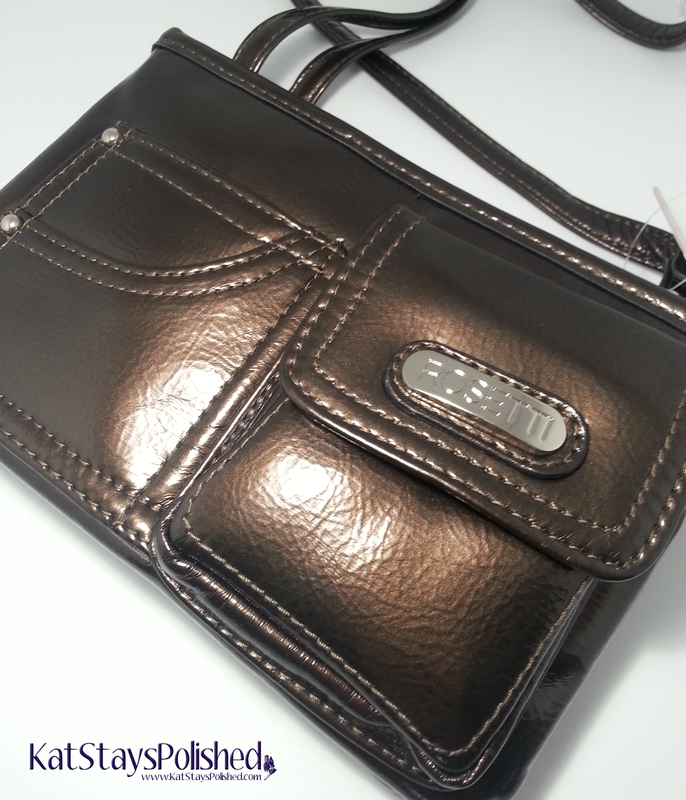 I also love that the name of this bag, Rosetti Kat Metallic Mini Crossbody Bag, had my name in it. So now that you've seen all of the pieces of this outfit, come check out the final outfit! 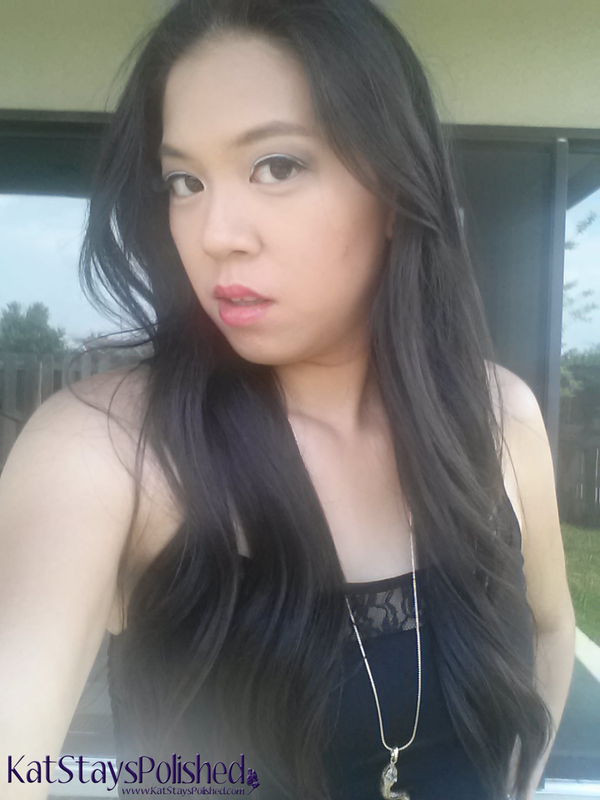 For my makeup, I did a simple smokey eye using Metal-ica, Allegro, and Lead Zeppelin. I used Don't You Want Me as my blush and Solid Gold as my highlighter. Finally, I used Vanilly for my red lip. Thanks to my husband for playing photographer for me. He's the best. It was nice a breezy outside so that helped to show off the dress a little more. Of course, once you're at that summer concert, you'll want to take a few selfies. You will definitely be selfie-ready with this great look from Kohl's! Kohl's has been around for a while and I'm so glad they are all over the place, including online. Do you ever shop at Kohl's? Tell me what your BEST deal ever was. *Gift card was provided by Kohl's to use at my discretion for this post. All opinions are 100% honest and my own. Hot stuff! The look turned out great! You look awesome! Great buys for under a 100.00. Thank you! And yea, I was surprised [and not so surprised] and how much I could get for $100! That dress is perfect for you!! You are so damn pretty...if I should say so myself! Remember we found some jeans, or tops or something at kohl's and after the sale and all the discounts, it only cost 7cents? Haha, thanks Dad! You're like, #1 Proud Dad over there. YES!!!!!! We used to get SUCHHHH amazing deals at Kohls!!!!! What a great summery look that's dressy but casual.